B1863. FLORENCE! FOSTER!! JENKINS!! !, The Life of the World’s Worst Opera Singer. Darryl W. Bullock. New York, The Overlook Press, 2016, 198pp. ; Index; Bibliography; Photos; DJ. “Under 200 pages, which is the length of Darryl W. Bullock’s charming FLORENCE! FOSTER!! JENKINS!! !, is just about right for those who want to know more about the world’s worst opera singer but might not want to know absolutely every detail. 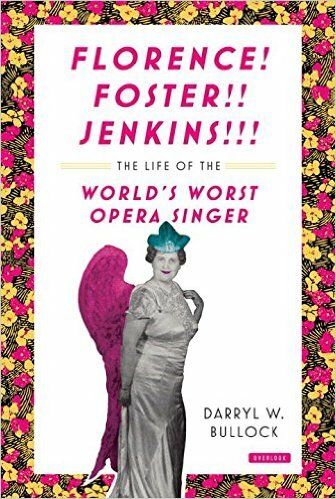 The story of Florence Foster Jenkins is quite astonishing. Born into a wealthy Pennsylvania family in 1868, she showed a strong early interest in music and the arts and succeeded in graduating from a music academy. She made an unsatisfactory marriage to a physician, and when this ended in divorce she enjoyed the life of a socialite in New York. After her father’s will ‘mysteriously vanished’ from his office safe, she succeeded, with her mother, to his extremely large estate and took up residence in a Manhattan hotel. There she conducted the life of a patroness of the arts, assisted and encouraged by an English actor, St Clair Bayfield, with whom she entered into what the couple described as a secret marriage.